During Computex 2017, Cypress Semiconductor announced availability of a new USB-C controller with Power Delivery (PD) that streamlines the design of power adapters, chargers, and power banks. The EZ-PD CCG3PA controller supports the PD 3.0 standard with programmable power supply (PPS) and Qualcomm’s Quick Charge (QC) 4.0 protocol, which enable new power source product designs to provide an improved fast charging user experience. As these standards and the USB Type-C standard continue to evolve, compliance and interoperability pose an ongoing challenge, but the programmable CCG3PA controller enables firmware upgradeability to keep up with changes and overcome interoperability issues. The new Cypress controller offers a high level of integration that minimizes bill-of-material costs and simplifies designs, replacing multiple discrete components with a single-chip solution. The EZ-PD CCG3PA controller is a one-chip solution that minimizes bill-of-material costs for USB-C power source products by integrating error amplifiers for constant voltage, constant current and PPS applications, a 30 V regulator that allows direct operation from VBUS, VBUS short protection on configuration channel (CC) pins, gate drivers for high-voltage power FETs, a low side current sense amplifier, and dedicated hardware for legacy charger detection protocols plus system level electrostatic discharge (ESD) protection. Programmable overvoltage and overcurrent circuitry protects systems against power overloads and other faulty operating conditions. The controller also integrates an ARM Cortex-M0 and 64KB Flash with read-while-write function for firmware upgradeability. The product enables design of efficient USB-C power adapters for a wide range of applications. The EZ-PD CCG3PA controller is now sampling in 24-pin QFN (16 mm2) and 16-pin SOIC (60 mm2) packages. The controller will be in production in the third quarter of 2017. Designers can get started with the CY4532 CCG3PA evaluation kit (pictured below), which is now available for $149. Cypress provides CCG3PA solution reference designs for a 45-Watt notebook PC power adapter, a 27-Watt mobile phone charger, a 60-Watt car charger and a power bank. More info on Cypress’ USB Type-C and PD solutions is available at www.cypress.com/Type-C.
Cypress’ EZ-PD portfolio of USB-C controllers already includes the CCG1, CCG2, and CCG3 programmable USB-C controllers, the CCG4 two-port USB-C solution, and CCG5, the market’s first two-port USB-C solution optimized for Thunderbolt notebook and desktop PCs, all supporting the latest USB PD 3.0 specification. The USB Type-C standard is gaining rapid support with top-tier electronics manufacturers by enabling slim industrial designs, easy-to-use connectors and cables, and the ability to transmit multiple protocols and deliver up to 100 Watts of power. Vesper recently launched the VM1010, which is the first wake-on-sound MEMS microphone that consumes nearly zero power. It allows consumers to voice-activate battery-powered smart speakers, smart earbuds and TV remotes without draining the battery. The inaugural member of Vesper’s ZeroPower Listening MEMS microphone product line, the VM1010 is a tiny, ultra-rugged piezoelectric MEMS microphone that that enables you to offer touchless user interfaces to consumers without any power-consumption penalty. Consuming a mere 6 µA while in listening mode, the Vesper’s VM1010 extends battery life to months or years by enabling the rest of the system to completely power down while waiting for a keyword. That is a major advantage to designers who can create an entirely new class of rugged, battery-operated, voice-interface devices that work anywhere. The VM1010 is a low-noise, high dynamic range, single-ended analog output piezoelectric MEMS microphone. It features a configurable voice zone, allowing voice in a 5-foot radius to 20-foot radius-zone to trigger the system and increase to a normal operation mode. When the environment is quiet, the system can enter ZeroPower Listening mode and the entire system can power down. Like other Vesper piezoelectric MEMS microphones, the VM1010 sets the standard for reliability and stability, even in harsh environments. It is dustproof to IP5X and waterproof to IPX7. Because it is stable in all environments, the VM1010 microphones are also ideally suited to microphone arrays, which are critical to far-field audio applications. Drawing a mere 6 µA of power in always-listening mode, the VM1010 extends battery life 10× or more. 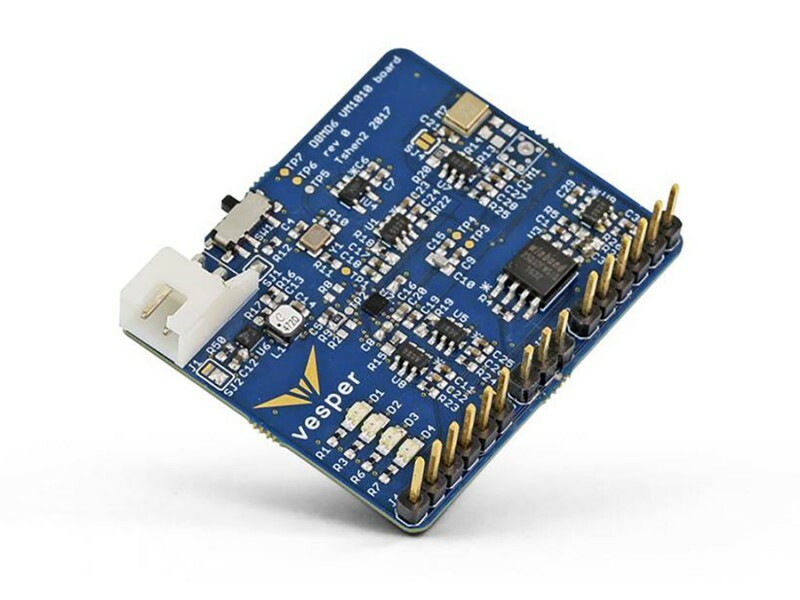 Vesper’s VM1010 is currently sampling and is available online through Digi-Key. 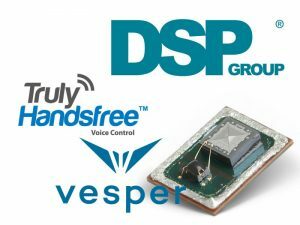 Test boards and reference design boards using VM1010, DSP Group’s DSPG DBMD6 and Sensory’s Truly Handsfree wake word algorithms are available from Vesper via an exclusive invitation-only program. Vesper’s MEMS microphones represent a radical shift from the capacitive MEMS microphones that are shipping by the hundreds of millions in smartphones, hearables, smart speakers, Internet of Things devices and connected cars. Vesper’s piezoelectric design is waterproof, dustproof, particle-resistant and shockproof. Piezoelectric MEMS microphones make voice-interface devices practical in any environment, and they are also ideally suited for far-field applications such as microphone arrays. Vesper, DSP Group and Sensory have demonstrated a turnkey development platform that boasts the lowest overall power consumption for far-field always-listening voice interfaces. The DSP Group also recently unveiled its new DBMD5 audio SoC built to drive clearer human-machine voice interactions. The Vesper-DSP Group-Sensory integrated development platform features Sensory’s voice algorithms, enabling ultra-low-power consumer electronics that wake at voice input. This platform is the first to achieve overall power consumption low enough to enable battery-powered always-listening far-field systems. The new development platform integrates Vesper’s VM1010 wake-on-sound piezoelectric MEMS microphone with DSP Group’s DBMD4, an ultra-low-power, always-on voice and audio processor based on Sensory’s Truly Handsfree voice control embedded algorithms. The platform gives developers the ability to initiate voice processing through Sensory’s wake-up word technology, which ensures that only a specific trigger word activates the device. DSP Group’s new DBMD5 audio SoC built to drive clearer human-machine voice interactions in microphone-equipped devices. By leveraging DBMD5 with HDClear technology to support hands-free device control, manufacturers can now add a voice-user interface (VUI) to their products for accuracy in high-noise environments along with control over voice triggers and barge-in capabilities. The DBMD5 solution offers sophisticated voice enhancement algorithms, including echo cancellation, noise suppression, beam forming and far-field support. Its programmable dual-core DSP supports digital and analog microphones, incorporating various application processor interfaces—such SPI, I2C, UART, and SLIMbus—while a complete suite of drivers allow rapid development and fast time-to-market.